(1) Kingdom of Laos edited by Rene de Berval that discusses Khun Borom in 2 short chapters. A chapter entitled: Legendary Origins - From the Translation by Louis Finot. And another chapter entitled: The Testament of Khun Borom - From the Translation by Auguste Pavie. And another book, (2) Thai Law - Buddhist Law - Essays on the Legal History of Thailand, Laos and Burma edited by Andrew Huxley. Specifically, there's a tiny chapter of 7 pages, entitled: An Introduction to the Laws of Khun Borom: An Early Prototype of T'ai Society and Life by Mayoury Ngaosyvathn. These 2 books discuss Khun Borom as part of a much larger book. However this one from Dominique is, for me, the first time I've came across a book in recent times that was written exclusively on the topic of Khun Borom. While other literature does exist on this, they are either not readily available or quite old. 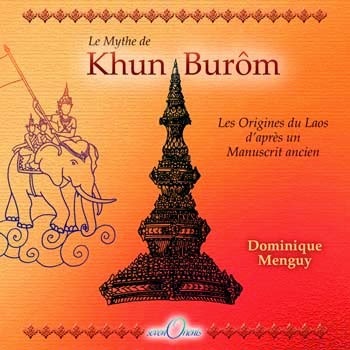 For those who don't know, Khun Borom/Burom is the supposed legendary (or mythical) father of Southeast Asian people. Lao people hold this myth in much higher regard than compared to its neighboring countries though. This book delves into the sections of the original Nithan Khun Burom (pronounced neetan koon borom, meaning: story of khun borom). The neetan koon borom was not just an origin story and its contents were not a single story but rather a collection of different stories, as well as laws and rules of conduct. This book takes a wonderful look in a succinct manner going into the descriptions regarding manuscript and its contents and style. Furthermore, it goes into the different sections and stories contained in the manuscript. And finally it goes on to discuss the subsequent historical affects of the manuscript to Lao society and the additions that are believed to have been made by King Vixun. This book is written in French and Lao. It's a good read and definitely worth picking up a copy. The full table des matières (aka table of contents) is below if you're curious to know all that it covers.